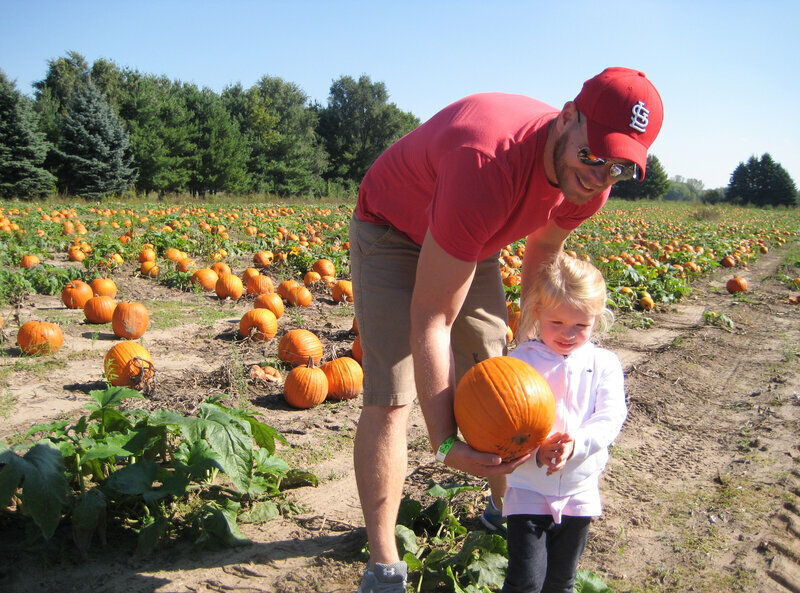 The pumpkin patch at Waldoch Farm in Lino Lakes, Minn.
It&apos;s pumpkin-selling season, and crowds are flocking to farms to pick out their own jack-o-lanterns. But this year, challenging weather conditions have cut the supply of pumpkins — both for carving and canning. Heavy summer rains in parts of the Midwest and elsewhere have left many farmers short on pumpkins. And in California, drought has squeezed the crop. All of that is also affecting canned puree makers, who consume about half of all pumpkins. Among those affected is Libby&apos;s, the largest U.S. producer of canned pumpkins. Libby&apos;s fills its cans with pumpkins that come mostly from Illinois, America&apos;s leading pumpkin producer. Roz O&apos;Hearn, a spokesperson for Libby&apos;s parent company, Nestle USA, says that rainy weather in Illinois cut the crop by half compared with 2014. "We think there&apos;s enough pumpkin to carry us through Thanksgiving," O&apos;Hearn says. "But we generally plant enough pumpkin so we have a cushion to carry us into the next year. And it doesn&apos;t look like that cushion is going to be there this year." O&apos;Hearn says she doesn&apos;t expect that lack of a cushion to affect prices this fall. 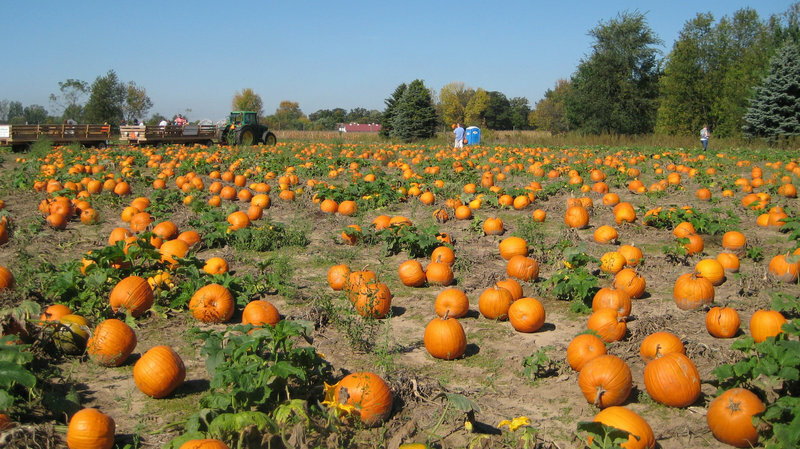 Pumpkins are a $145 million industry, according to statistics from the National Agricultural Statistics Service. That&apos;s a small amount compared to other produce. But demand for pumpkins is rising — production is up nearly 30 percent over five years. O&apos;Hearn says there should be enough supply to fill our pumpkin pies through Thanksgiving — but after that, she says, there&apos;s going to be a shortage until the next harvest. Increasingly, some pumpkin growers are navigating shortages by selling not just pumpkins but family fun — with attractions like corn mazes and petting zoos. For instance, at Waldoch Farm, a Minnesota farm just north of the Twin Cities, admission starts at $10. Add a hot cider and a hot dog, and a family of four could end up dropping $50 or more. Doug Joyer of Waldoch Farm is a fourth-generation farmer, but the first in his family to rely solely on the farm for income. He says he added a corn maze five years ago by popular request. "People called us asking if we did a corn maze," Joyer says. "They kind of assumed we had a corn maze if we had a pumpkin patch." Joyer&apos;s farm sells decorative and small-pie pumpkins, which are also experiencing a shortage — though it&apos;s not as severe as the one facing pumpkins used for processing. Paul Hugunin, a marketing manager with the Minnesota Department of Agriculture, has watched farm culture for the past 27 years. He says this addition of entertainment is how a lot of pumpkin farms are staying profitable even when the harvest is light. "The biggest change we see with pumpkins is not so much the number of farms growing them or the number of pumpkins they&apos;re raising," Hugunin says. "It&apos;s what goes along with that."